The Rittenhouse Writers’ Group is a series of quarterly fiction writing workshops. 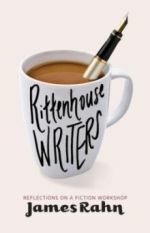 If you’re tired of working in isolation, if you want to meet other writers, if you’re preparing for a graduate level writing program, or if you just want to get some writing done, the Rittenhouse Writers’ Group may be for you. We cut through formality and empty theory to get to your writing. We encourage diversity, and don’t get stuck on one approach or style of writing. RWG provides a forum of readers’ voices, a supportive audience made up of your peers, along with suggestions and advice on ways to improve your writing from its founder, James Rahn. Mr. Rahn has published Rittenhouse Writers, Bloodnight, and stories in many literary magazines. He taught fiction for fifteen years at the University of Pennsylvania, and has an MFA in Writing from Columbia University. and what doesn’t in your fiction. James Rahn maintains a private practice of psychoanalytically-informed consultations for writers.